Fall is my favorite time of year. I love seeing the leaves change color and feeling the crisp evening air on my face. I enjoy summers with my children very much, but I also appreciate their return to school as it allows me time to dedicate to my work. Along with the start of the school year comes the very familiar task of packing lunches. 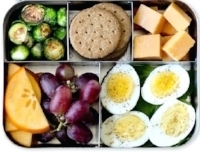 I choose to pack lunch for my kids for several reasons; I feel I can offer them balanced meals they’re more likely to eat and I know what’s going into those meals. I think part of what makes packing lunch challenging is when we fall into a rut. We are relying on the same tried-and-true recipes that when made often enough, become downright boring. My middle-schooler will eat just about whatever I pack without a complaint. My younger child is looking for eye-appeal and novelty. The latter takes a little more planning. I can’t produce such appealing meals at 6:30am on the fly! Lunch prep doesn’t have to be a daunting task. I’m sharing a few tips that I’ve used with my kids to make packing food to-go more inviting. Work with your child - set aside time to brainstorm ideas together. I found a great list of a 100 lunches, dietitian approved! I gave my daughter this site for inspiration and had her come up with her own list. Shop together - take time to read through the nutrition label. Anything coming out of a box or package is processed. Try to limit these packaged foods and choose those that have the highest fiber, lowest sugar, and the least amount of ingredients. Mary’s Gone Crackers for example would be a healthier option than Cheez-its or GoldFish. Invest in a few appealing lunch containers. Lunchbots and Planet Box are a couple good ones because they are free of plastic and BPA. These are great for the child or teen that prefers their food to stay separated. Cookie cutters can be used to quickly cut a sandwich into a heart or star which makes lunch playful. Put it on a stick - kabobs are easy and fun. My son made an easy caprese salad using cherry tomatoes, mozzarella balls, and basil. Fruit like strawberries and grapes as well as cheese and olives work great on a stick. You can chop off the sharp end for younger kids. Break it down - baked tortilla chips, beans, cheese, salsa, and guacamole can be put in separate containers to make a deconstructed taco lunch. Hydrate - don’t forget to fill their bottles with fresh filtered water. Using a steel water bottle instead of a plastic one will keep harmful chemicals out of the body. Don’t assume that if it’s “BPA free” it’s free of toxins. I found that planning ahead was my biggest time saver and helped keep morning stress levels down. Cold items like sandwiches or dry goods like homemade trail mixes can be packed the night before. Hot items, however, will need a quick reheat in the morning. Fruit also looks more appealing when freshly cut, so save that task for the morning as well. If you’re interested in learning more about healthy eating for kids, join me Thursday, October 1, 6:30-7:30pm, at the Martinez County Library for my talk “School Fuel.” Register online for this free event.